Under 16s won the Knock Out Cup with a 2 / nil win against Mildura City after extra time. 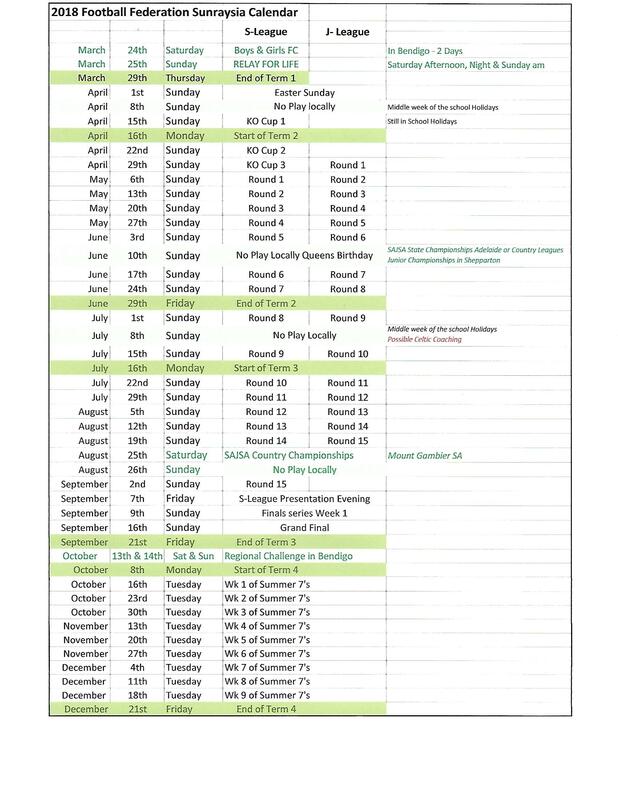 Draw and Timetable for Round 1 of the 2018 Rudi Horvat KO Cup. Registration is to be completed online at​: http://www.playfootball.com.au/ and payment can be made at the club rooms on training nights. ping a stunning season with a senior Grand Final win of 1-0 vs Three Colours on Sunday 11/9/16, the Irymple Knights soccer club players and members have been buzzing with excitement. The Irymple Knights seniors remained undefeated all year, winning the pre-season Knockout cup, FFS Premiership and Grand Final cup titles in 2016. Congratulations to our Senior team and to all of the other teams who participated in the grand final series. 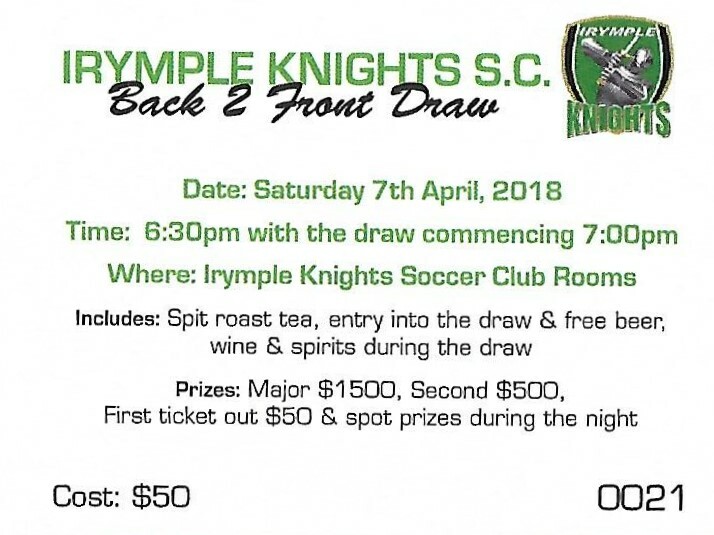 IRYMPLE KNIGHTS SOCCER CLUB PRESENTATIONS INFO. Irymple Knights Soccer Club would like to invite all players, coaches and their families to celebrate another fantastic year at the upcoming club presentations. All club trophies and awards will be presented to players, coaches and volunteers. SUB JUNIOR/JUNIOR PRESENTATION (SUB JUNIORS, U12s, U14s): SATURDAY, 10th SEPTEMBER, 2016 From 11.00 am at the Irymple Knights Soccer Clubrooms, Henshilwood Oval Reserve, Irymple. No tickets necessary. SENIOR PRESENTATION (U16S, RESERVES, WOMEN, SENIOR MEN): FRIDAY, 16th SEPTEMBER, 2016 From 6.30pm at the Irymple Pub, 15th Street, Irymple followed by an after party at the Irymple Knights Soccer Clubrooms. Tickets are $50 (including meal) available from the club. The FFS Presentation Night will be held on Friday 2nd September 2016 at the Mildura Lawn Tennis Club starting at 6.30pm. Presentation of association club premiership medals/trophies, best & fairest, best & fairest runner's up, highest goal scorer, club of the year, referees awards and FFS Association person of the year will all be awarded on the night. Drinks at bar prices. There will be no BYO. Costs for the tickets will be $35.00 for adults/ children 12 years and above and $15.00 for children under 12 years of age. Food will be supplied by Ziggy�s Cafe and will be served throughout the evening. er a tantalising year of intense competition the Irymple Knights have come out on top, securing 2016 League Premierships for U16s, Reserves and Senior Men teams. Our Senior Women finished Runners up, while our U14s & U12s finished 3rd & 4th respectively. All of our teams, from sub juniors to seniors fought hard all year and played with respect and dignity as expected. We are very proud of our players, club officials, coaches and club committee who conducted themselves appropriately throughout the season. We thank all of our players, coaches, officials, marshalls, parents, spectators and all who volunteered their time so that our club and competition runs as smoothly as possible. The Grand Final series for the top four teams of the FFS League will commence Sunday, 4th September. Good Luck to all of our teams for the Grand Final series. Please join us to celebrate our achievements at our Club Presentations coming up in September. More details will follow soon. First ticket out $50 & spot prizes during the night. Please ring Luke Pain for tickets on 0408613830 or Andy Koren on 0402301769 or see these people at training. The Irymple Knights Soccer Club would like to welcome all past and new Men & Women players to pre-season training on Tuesdays and Thursdays beginning 26th January, 2016 from 6.30pm.